I have never got Twitter. I have, in fact, been quite mean about it in the past (see my “Twittering Nonsense” post here), then I changed my mind and decided, misquoting Shakespeare (one of my all time favourite people), that “there is nothing (inherently) slow or fast, but thinking (or acting) makes it so”. So, I decided I would give it a go (you can see my thought process on this post here), and set up a Twitter account (twitter.com/theslowcoach), due to a tiny legal issue (which I won’t go into, it is very embarrassing) I had to change that, so I changed to twitter.com/tortoisemind. But I never really got the hang of it and only really used it to bookmark these blog entries (I mainly got talked into Twitter as a way to promote myself, which is wrong, I know!). I never really tried to get any followers or follow anyone. I just couldn’t get my head round it (I had a friend – somewhat of a self proclaimed internet marketing “expert” – try and explain what I should be doing on several occasions, but it all seemed far to complicated, and cynical – but more on that in a little while – for me). But, since deciding to make this a Slow Blog, and taking the pressure off myself to write an entry regularly, even if I couldn’t think of anything to say, I thought I would take another look at Twitter and see if I can get into it. I have to say, I have relaxed a tad too much and have had to really force myself to write something on this blog! For the first two weeks it didn’t even crossed my mind to blog, it was great, I felt a sense of freedom and relaxation I hadn’t had for a long time. And, that is really the point, slowing down, isn’t really about being slow, it is about following your own rhythm and if you are not in the mood to do something you shouldn’t force yourself. However, maybe I relaxed a little too much…? Anyway, back to the Twitter thing. I thought, since taking the pressure off myself to try and write a blog every day, I could start using twitter for more regular updates. Is it really possible to be a Slow Twitterer? I don’t know, I am still mulling it over, I will continue to try and experiment, but here are my thoughts so far. 1) It seems rather pointless. I already have plenty of ways to keep in touch with my friends (text, email, letter, and – shock, horror – actually talking to them face to face) and facebook (which I use, but am not the biggest fan of – read Tom Hodgkinson’s excellent article on it here) already has a status update option, why do I need another way to tell people what I am up to? And do they really care? 2) The whole essence of Twitter encourages impatience and lack of attention. If you don’t tweet at least every 33 seconds people will stop following you, heading off to find another font of instant information. 3) …like all other social networking sites (but Twitter, with it’s simplicity, seems to encourage this behaviour most), the minute it becomes popular, “methods” spring up to help you promote yourself and suddenly it is flooded with wannabe entrepreneurs, all shouting about their own stuff. My aforementioned friend told me that how I should be using Twitter is to search for people who are interested (or tweeting about) the area of work I am in and then become friends with them. Twitter etiquette, apparently, is then that they follow you back and VOILA you have someone you can plug your wares to. The thing that makes me wonder about that is, if you are following them just to get them to follow you, and therefore, have little intention of reading their tweets, how interested do you think they will be in what you have to say? Surely it just ends up with lots of people muttering to themselves? It just seems that twitter lends itself much more to this banal, self-centred shouting. 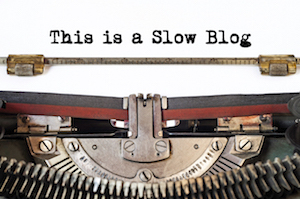 Breaking the golden rule of “slow blogging” which is a willingness to keep quiet whilst all other bloggers are shouting “listen to me, listen to me!” It is about not trying to be the loudest voice out there. However it seems that all this worry about whether I should twitter may be irrelevant. Twitter may have had its day. According to reports and the people rarely check back after the first 2 months(read the Tech Crunch article here and the Harvard Business School blog here, there is more research, but I couldn’t be bothered to search for it). So it seems to me Twitter is full of celebrities trying to circumvent the gossip columns and tabloid presses to talk to their fans directly (which I think is actually an amiable thing to do) and “entrepreneurs” (I use that word advisedly) muttering to themselves trying to flog their snake oil. The true users (the ones I assume twitter was set up for) seem to have got lost in the middle somewhere (and just seem to follow their favourite “celebrities”). Basically, it feels horribly, horribly cynical. Of course, this is a very negative point of view and could possibly be me just trying to justify my total confusion (and disinterest) in it? So, putting my negative attitude and emotions to one side and assuming Twitter doesn’t go horribly out of fashion in the next few days, how can I attempting to embrace Twitter in a Slow Manner? 1. I tweet when I tweet. Don’t expect regular updates, you won’t get them. 2. I will only follow someone, if I genuinely want to hear what they have to say, not so that they will follow me (so don’t follow me just to get a reciprocal follow – you probably won’t get one – follow me because you want to hear what I have to say). 3. I won’t use twitter just for brainless self promotion, and will only tweet something I think will be of interest to my follows, including links and alerts about new blog entries. Let’s see how it works out shall we? If you liked this post, please bookmark it on Digg, Stumbled Upon, Twitter, etc. I would really appreciate it.